This is my 6th time thru the Challenge today. This last one I'm posting. 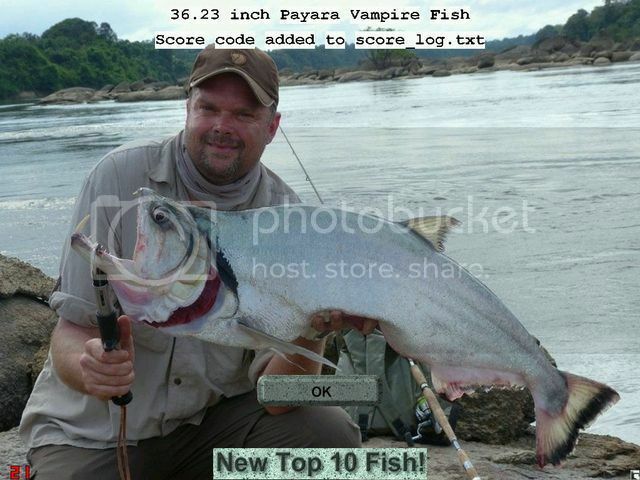 This one was a heart thumper especially when I hooked my 3rd Arapaima. I couldn't believe I got 3 caught at this point. 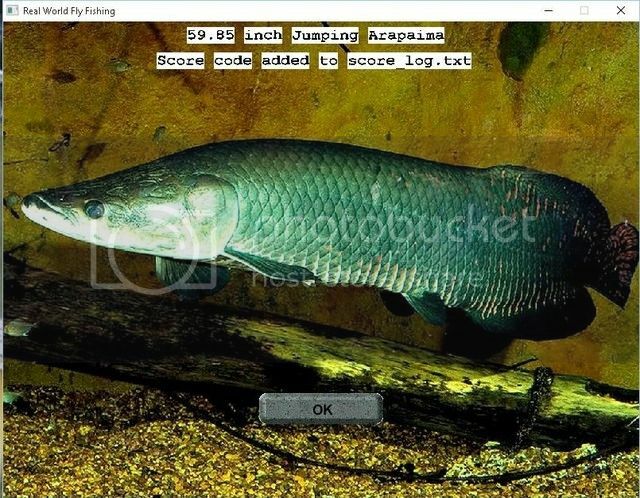 Had a lot of nerve racking moments on the 3rd Arapaima, it would stay down for a while then all of a sudden come up and start jumping like crazy. Thought a few times he was going to snap me off. But finally alot of finesse and patience, landed the fish. 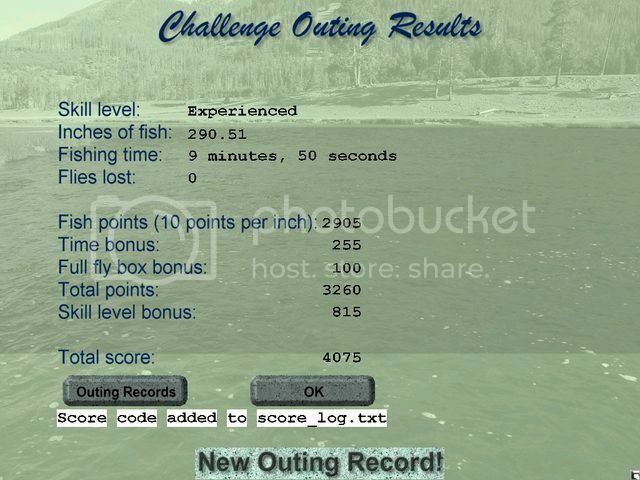 Got to site 8 and 9 and got 2 30 + inch fish. Site 10 couldn't believe it and hooked a 4th one, ended up the biggest one so far that I caught in the challenge. For some reason, this one wasn't jumping as much but made some sudden lightning runs where I thought he was going to snap my line since I was close to being spooled. Finally after about 10 minutes finally landed the fish and when I saw how big it was I didn't know what to think. I will have Stanley go ahead and verify my score. 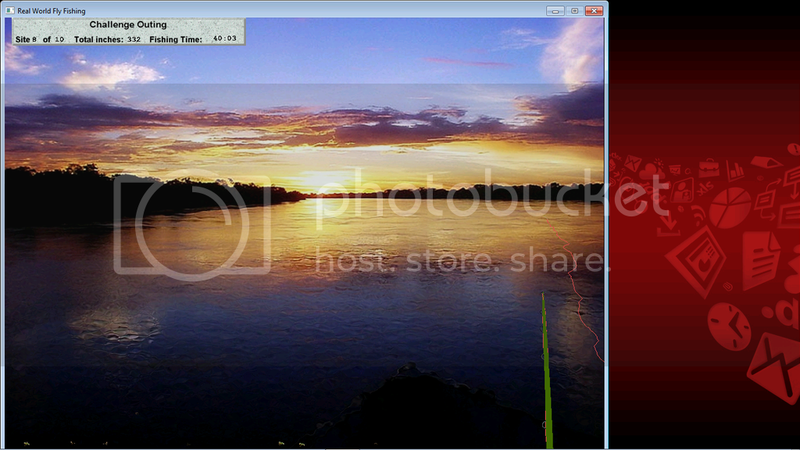 But will post it now. Good luck to everyone. This score can be beat. 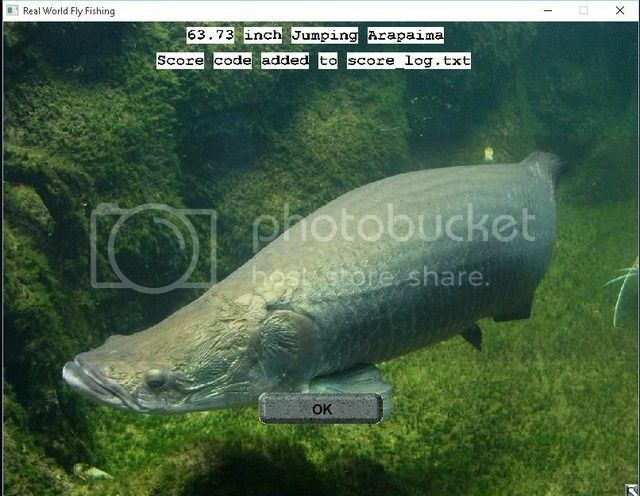 I did catch a few small ones and the Monster Arapaima is still setting out there waiting to be caught. WOW! That is a fantastic score and surely something to be proud of. Catching 4 Arapaimas in one challenge is a challenge in itself. Congratulations! Your score are legal and verified. Now Badger will have a lot of catching up to do before the deadline. Here's my last 3 trys on the challenge. Don't need verified because nothing is there to compete against. 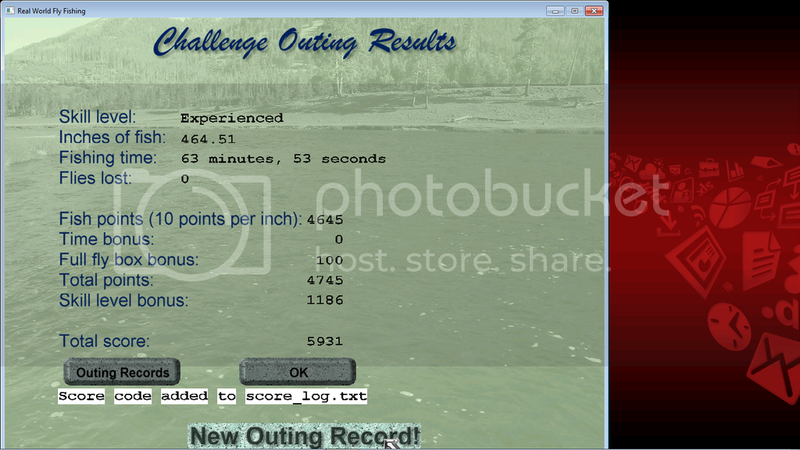 The 3rd set of scores was caught on a top water Fly. % days left in the competition. So lets see some scores from everybody. Good Luck. This last one was all top water. No verification needed. No competitive Scores. Roger, that is very generous of you to give up your high score to get more people into the competition. However, a Challenge is a Challenge and there isn't any need for you to do that. 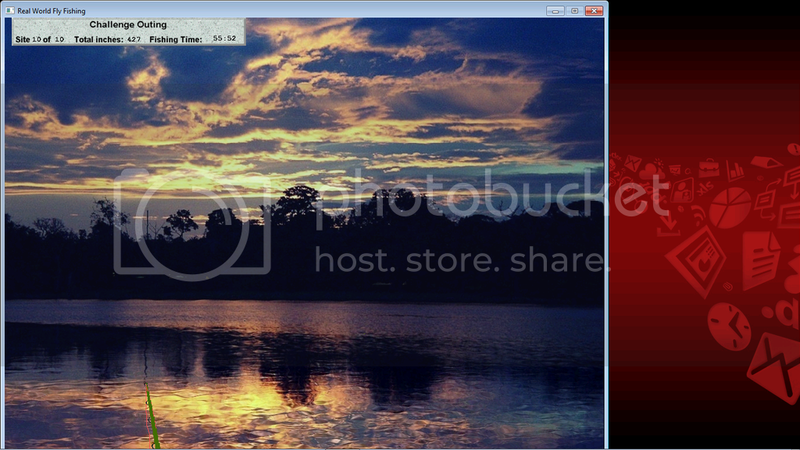 Too bad what started out as a nice and exciting challenge fizzled out with not too many people participating. Maybe they have better things to do at this time of the year? Anyway, I've already got a couple of very nice prizes for the Best Score and Biggest fish caught while fishing the tournament. 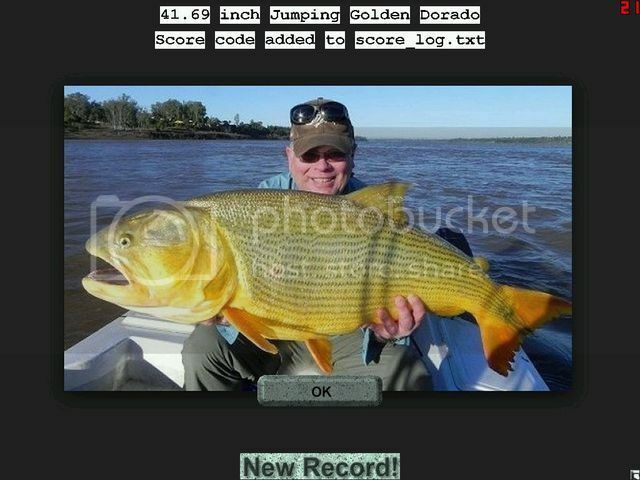 I have decided to give those out anyway to the top score and biggest fish when the tournament is over. So we will wait and see if we have better scores coming in. Even though the tournament is not "legal" with no enough people participating, I think our top competitors deserves a special thanks from me for their support of the Challenge, and the RWFF Forum. Well this is the first chance I had to fish in 2 days. Had a blizzard here which started early Wednesday Morning and ended Thursday. High winds, 1 to 2 inch snowflakes through the 1st 10 hours of the storm. Some of the wettest and heaviest snow that I could remember. Between my house and my Parents next door took 12 hours of shoveling. Now Sunday we ill be in the 60's, typical Indiana weather. No verification needed, doesn't change any scoring totals. 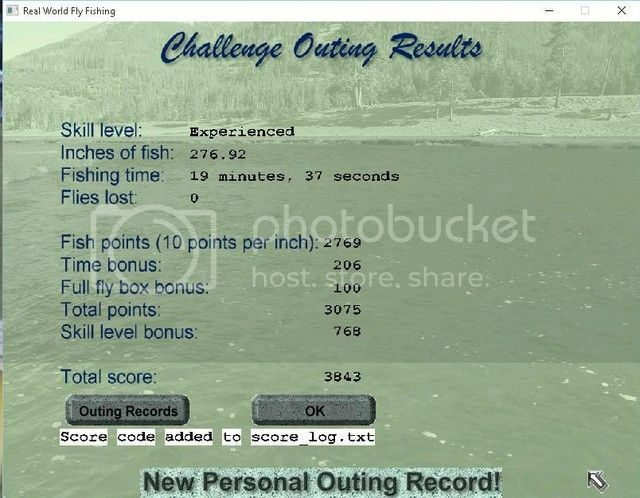 My Grandson Chris which is 10 years old wanted to fish the Challenge. 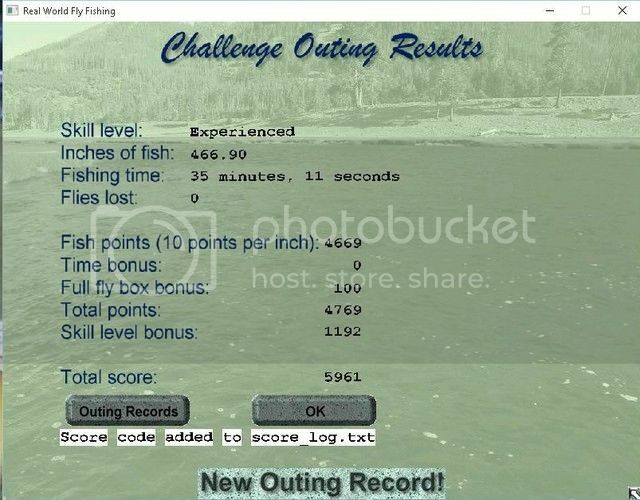 He hasn't fished the game in a long time, so I had to do a little coaching to him. 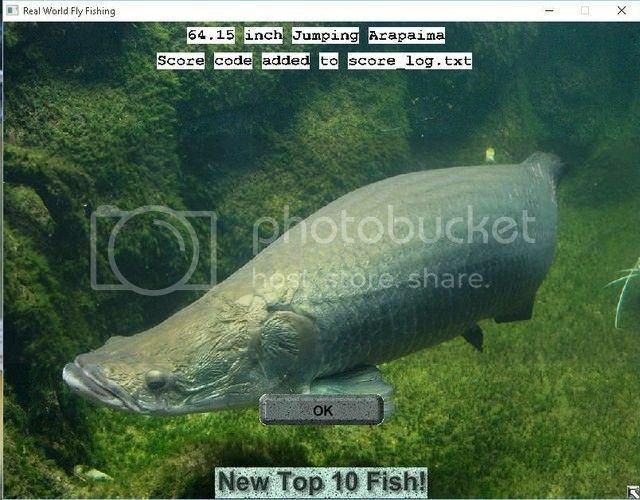 For the first time fishing in a long time he did fairly well and did catch a nice Arapaima. His second fish he would have caught was a Piranha. 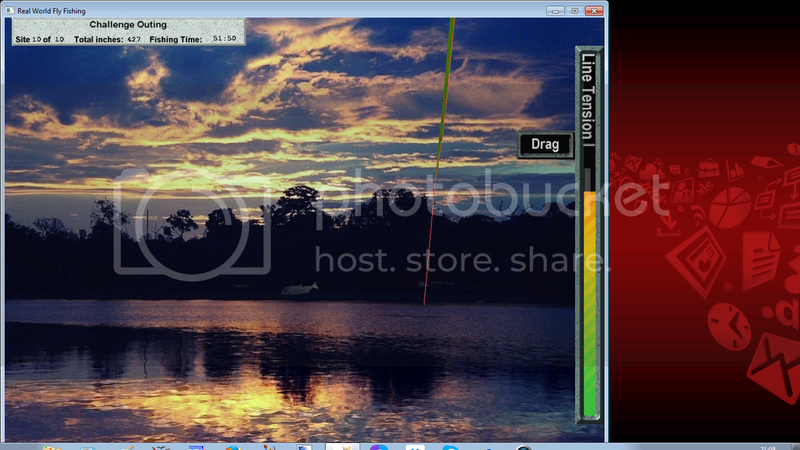 He reeled it in to quick and he thought it snapped his line, it only threw the hook. After that he settled down and did a fairly decent job. 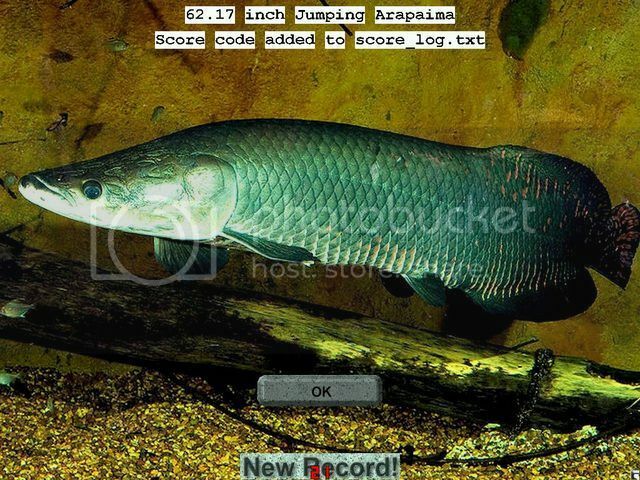 I'm posting his score and a picture of his Arapaima. This challenge is verified and legal. Last edited by rwwalleye on Sun Feb 28, 2016 5:29 am, edited 1 time in total. Haha, that is fantastic and makes all the hard work and long hours worthwhile for me. RWFF is a great game not only for adults, it gets the family involved and they can spend some quality family time together. 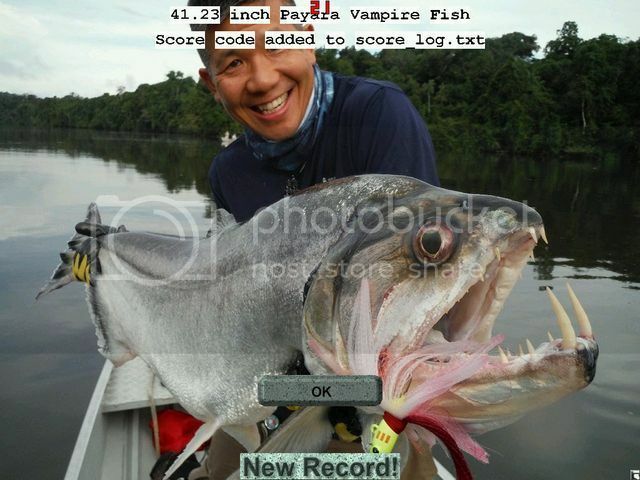 The game also helps to nurture future fisherman and for many of them, fishing will be life long hobby and love. 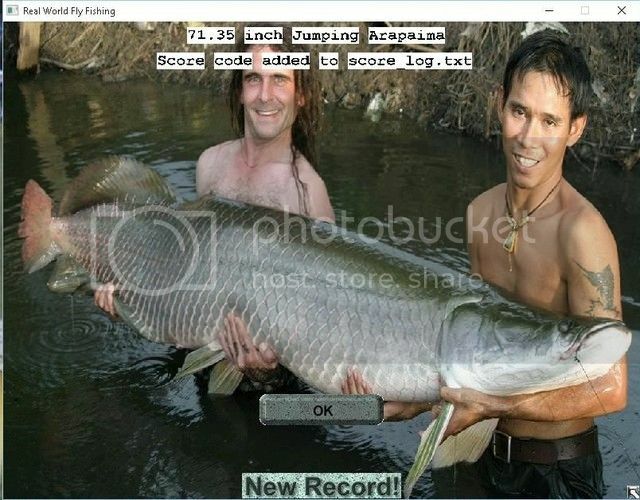 I think it is great that Chris wanted to play the game and caught a big Arapaima while doing it. Please congratulate him and give him a pat on the head for me. There is about one day left of the tournament so please turn in your scores to Roger for verification. Roger will make a formal announcement on the Forum when the Fat Lady sings. 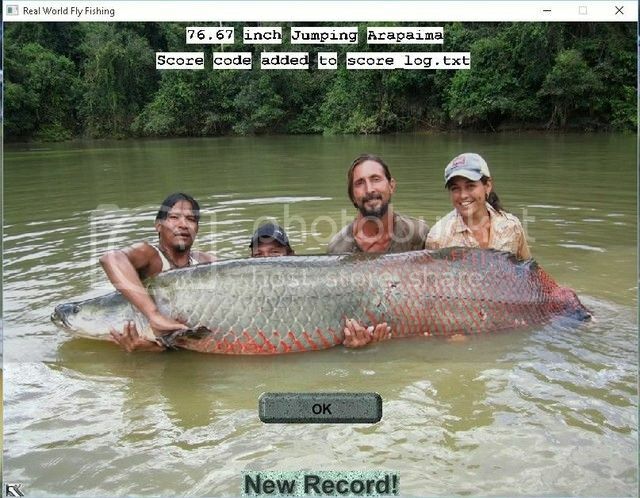 C'mon you guys, if 10 year old Chris can catch a big Arapaima so can you. Well there is 12 hours left on our Challenge. This morning while I went next door to have coffee at my Parents, Chris decided to try the Challenge again. Even though the fish isn't legal because he didn't finish the challenge, I figured that I would post his first fish that he caught. When I came back home he told me he caught an Arapaima but quit after he caught the fish. I couldn't believe what he caught on his own. I was very impressed. 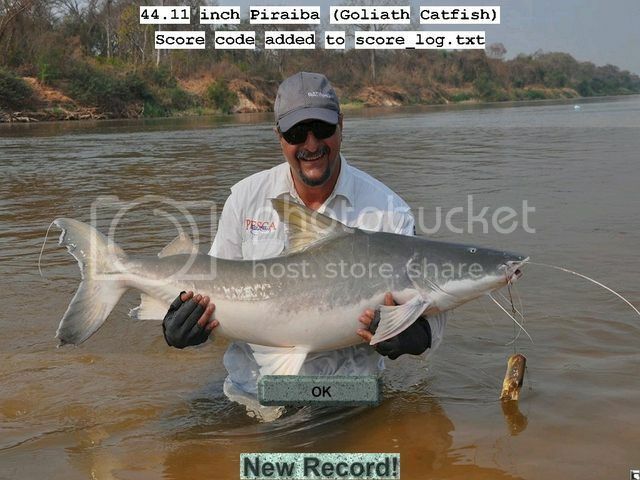 Here is what he caught on first sight of the challenge. No verification needed, no competitive scores. Stanley beautiful outing - Bravo, join at the last moment. Result is the a weak albeit appended to your competition . Gentelmen's applauded for impressive results and a great catch.